A Gloucester County bankruptcy must file in the New Jersey District Bankruptcy Court in Camden, New Jersey. For over 25 years, the Gloucester County bankruptcy attorneys at Puff & Cockerill, LLC, have helped ease the financial burden for individual’s facing debt and bankruptcy. Today, many Gloucester County households are living paycheck to paycheck and are just barely able to afford their monthly bills as they come due. What happens to those bills when someone loses a job or when someone becomes disabled or unable to work for a long period? The answer is simple: the bills keep coming and debt accumulates. Dealing with these monthly bills and debt is stressful when you do not have money coming in to pay them. Bill and debt collectors do not want to hear that you lost your job, you are currently unable to work due to disability, or that you are on a fixed income and cannot afford to pay their bills. Bill and debt collectors only want to know when and how much they are going to be paid. A Chapter 7 bankruptcy is available to “discharge” most, if not all, of your unsecured debt, for those people who are eligible. A “discharge” releases a debtor from personal liability for the debt owed. This occurs when the debtor asks the Bankruptcy Court to be legally relieved of the obligation to repay an unsecured debt, such as credit card debt, unpaid medical bills, unpaid utility bills, etc. A Chapter 7 bankruptcy will not eliminate secured debts, such as mortgage payments and car loans. To be eligible for a Chapter 7 bankruptcy, a debtor must demonstrate that his/her income is low enough to file a Chapter 7 bankruptcy. In order to qualify, a debtor must pass what is referred to as the “means test.” Under the “means test,” if a debtor’s current monthly income is less than the median income for a household of his/her size, the debtor will pass and thus be eligible to file a Chapter 7 bankruptcy. On the other hand, if a debtor’s income exceeds the state median, the debtor must determine whether he/she has enough “disposable income” (income left over after payment of allowed monthly expenses) to pay off a portion of their unsecured debt. 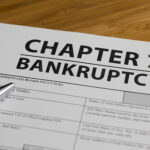 The higher the monthly disposable income is, the less likely a debtor will be able to file a Chapter 7 bankruptcy. For over 25 years, the attorneys at Puff & Cockerill, LLC, have helped ease the financial burden for individual’s facing debt and bankruptcy in Gloucester County. We encourage all local individuals to consult an experienced Gloucester County bankruptcy attorney. A listing of your monthly expenses.